Adonmo has digital screens on cab tops that identify time, location and a person’s income, age and gender and displays relevant advertisements. When colleagues Sandeep Bommireddi and Sravanth Gajula were looking to venture into entrepreneurship, they were looking for meaningful problems to solve when Sandeep was reminded of his previous startup 7Pages, a designer notebook company that had inspirational entrepreneurship stories. An otherwise successful startup saw its demise due to the high cost of advertising for scaling up. 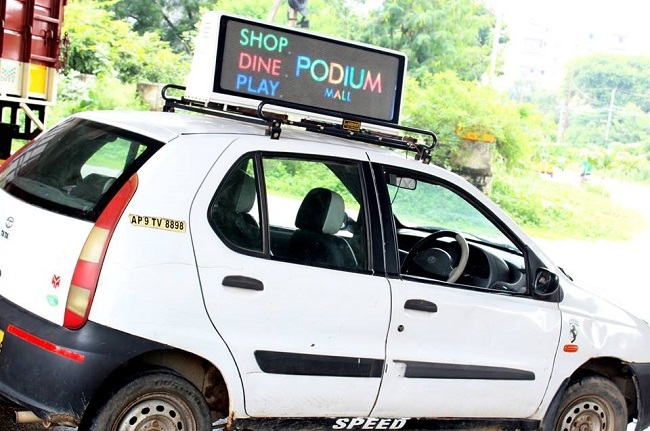 Sandeep and Sravanth decided to tackle the problem of expensive outdoor advertising. For reference, on an average, a hoarding costs at least Rs 5 lakh per month while advertising on a foot-over bridge costs around Rs 8 lakh per month, says Sandeep. “Initially the idea was very different. We wanted to identify private car movement patterns and advertise through stickers on these cars, which are relevant only to these locations and these car owners would make money by advertising as they drive around. But we realised our value addition over existing stickering companies wasn’t more than 20% and so decided to move to digital,” Sandeep says. And digital didn’t mean they gave up on outdoor advertising. Thus was born Adonmo, a Hyderabad-based startup which gives time and location-based advertising to advertisers using digital screens that are mounted on top of cabs. For example, restaurants can advertise during lunch or dinner time. With this idea, they started building the product. “A few months into this, we had a eureka moment to take it to the next level. While time and location are just a part of it, we decided to focus on reaching a specific target audience. There are very specific companies like schools and maternity hospitals, which target specific people. For them, more than location and time, it’s important to reach the right kind of audience based on age group and income segment,” he adds. That’s what Adonmo does today; advertising with digital screens atop cabs that target people outdoors based on income, age, time and location. Sandeep claims that this form of targeting based on age, gender, demographics for outdoor advertising is happening for the first time in the world. Adonmo has developed a patented technology – having filed six patents – which uses several sensors placed on the device, giving knowledge of what’s happening around. It helps the device understand the kind of people around it, combined with cloud insights to display relevant ads. To mount the display on cabs, Adonmo partners with cab driver groups and gives them the technology for free. Currently, even all devices it mounts are being given for free. Once mounted, based on where and for how long they go around, cab drivers are paid by Adonmo, giving them an additional revenue stream. On the client side, Adonmo charges clients based on every minute the ad is displayed for. While the device and technology are currently free for drivers, Adonmo is looking at doing a co-owning model where it retains some part of the monthly earnings for the device. The hoardings are made and coded in-house at Adonmo’s manufacturing facility in Hyderabad. Adonmo currently has over 100 cabs plying with display screens in Hyderabad and has another 400 drivers signed up in the pipeline. Since inception, Adonmo has 18 clients on board including FirstCry, Treebo, Leonia resorts, Smile Dental and Jain International School. This Hyderabad-based startup is currently being incubated at startup engine T-Hub. It also has a small presence in Vijayawada and Visakhapatnam where it ran a few pilots. Over the next 3-6 months, it plans to enter markets such as Mumbai, Bangalore, Chennai and Delhi. However, a digital screen flashing ads could be seen as a distraction for people on the road. Sandeep says that the company is working with the Telangana government and has defined a few guidelines in terms of how many ads can be played, the brightness and how flashy the content can be. “We don’t demand the person to look away from the road to view the advertising. We have in fact pitched that we are safer because relative velocity is relatively less. The ad is travelling with you and hence is less distracting than other types of ads, which require you to look away from the road,” he adds. It is also looking at going beyond just cabs to explore the option of mounting displays on other automobiles as well. Eventually, the idea is to advertise in indoor spaces such as subways and elevators. “The kind of intelligence we are building will be path-breaking for these networks as well. If not providing displays ourselves, we want to provide intelligence we build to these network providers who can leverage them,” Sandeep says. The idea is for Adonmo to evolve into a more platform-based advertising intelligence company rather than being a space provider, which it is today.